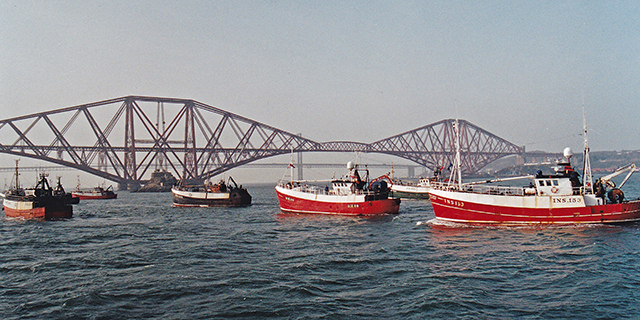 Fifteen years ago this week, 168 Scottish boats formed a huge flotilla; a remarkable sight as it steamed under the world-famous rail and road bridges spanning the Firth of Forth. Carried out with military precision, the highly visual demonstration was organised by the Fishermen’s Action Committee to bring its total and united opposition to being forced to slaughter immature fish, right into the home of the Scottish Parliament in Edinburgh. 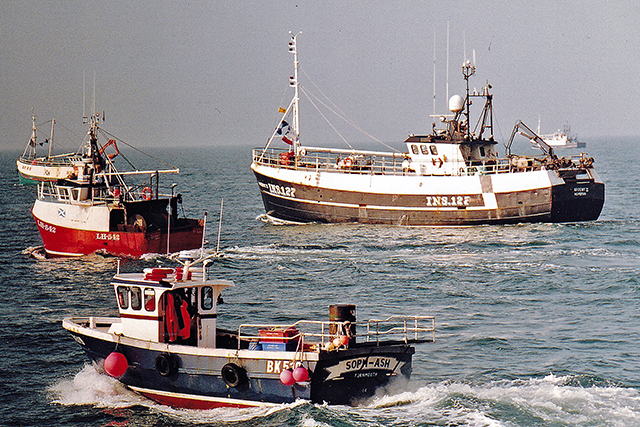 David Linkie looks back on a momentous day, widely recognised as being a watershed moment in the history of the fishing industry. 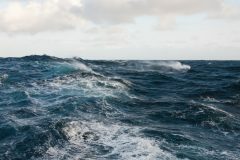 The catalyst for the dignified mass protest, held to raise public awareness of the virtually impossible position in which whitefish skippers found themselves, was the sudden political decision to close 40,000 square miles of traditional fishing grounds in the first stage of a five-year cod recovery programme. 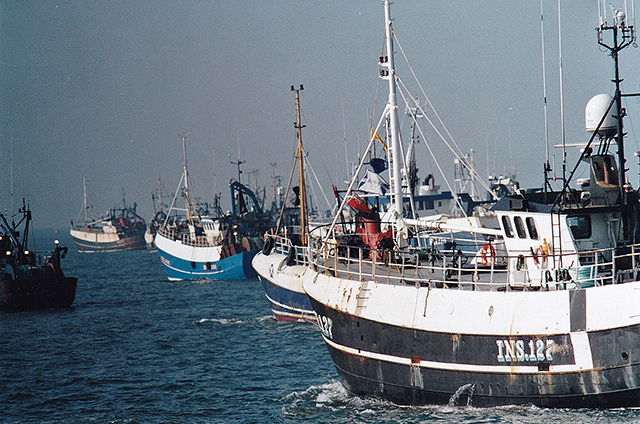 As a direct consequence, the Scottish whitefish fleet immediately found themselves penned into a small area of sea for small haddock and whiting for the next two months, which would have endangered the valuable stocks that represented the future of the industry. 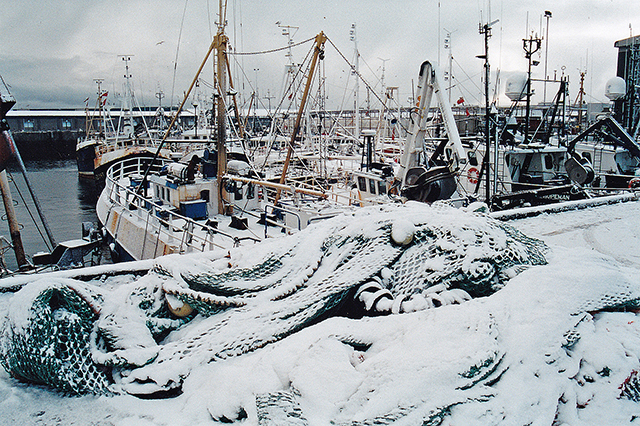 Severe winter weather and tied-up whitefish vessels brought a particularly bleak appearance to usually busy harbours in north-east Scotland in 2001. Faced with the dreaded prospect of slaughtering huge hauls of immature haddock, that would represent a large proportion of the catches and, therefore, income in years ahead, the first skippers to land after being forced to finish their trips in this area, immediately decided to tie up their boats. As other vessels landed, their skippers immediately joined their colleagues alongside the harbour wall. 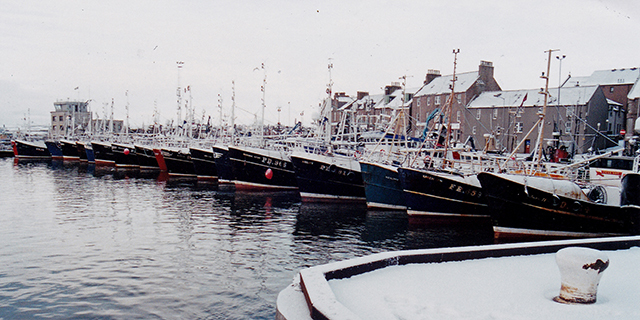 Within seven days towards the end of February 2001, virtually all the Scottish whitefish fleet was in the harbour. 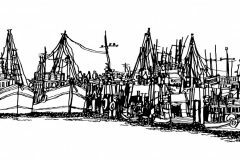 The extent of the despair felt by skippers at this time can be gauged from the fact that, although not directly affected by the cod box closure, the prawn fleet remained in port as well, in an unparalleled show of solidarity. Twenty whitefish boats berthed stern to the quay at Peterhead in the early days of the voluntary tie-up skippers put in place to protect a particularly large blood stock of young haddock which would be of vital importance to the fleet in years to come. After a ‘grassroots’ Fishermen’s Action Committee had been formed, more than 250 skippers attended the first meeting of this non-affiliated group, of which Peterhead skipper John Buchan was elected chairman. The depth of feeling and anxiety they were experiencing at this time were indelibly etched into the faces of skippers who attended this watershed meeting, at which the need for a funded tie-up scheme was unanimously agreed. 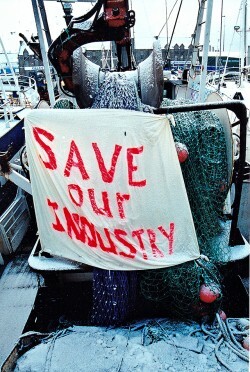 Twenty-four hours later the industry’s plight was first brought to the public’s attention when 45 boats steamed from Fraserburgh and Peterhead to Aberdeen, in snow blizzards, to make a dignified and peaceful demonstration when they tied-up at the fishmarket. 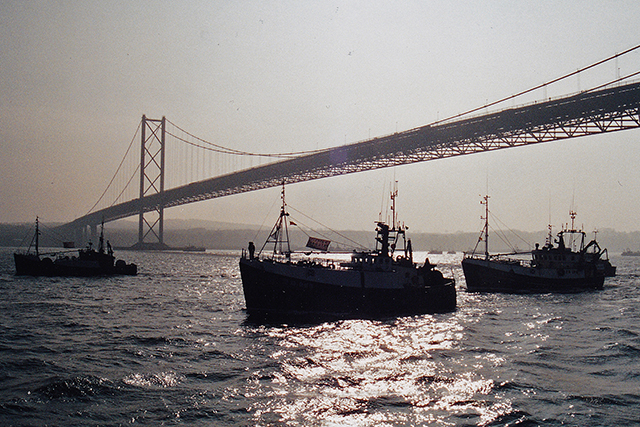 The following day a cavalcade of crew buses was used to transport 500 fishermen to Edinburgh, where they created history by participating in the largest lobby since the Scottish Parliament was formed at Holyrood. Both events attracted widespread media coverage and public support. A clear cry for help – was it heard? Following further meetings over the weekend, plans were drawn up that would see 168 boats take their case to the heartland of Scotland’s government, sailing 10-abreast at times, under the famous Forth Bridges. On the same day, Shetland fishermen showed their support by sailing to the Sullom Voe oil terminal from Lerwick, taking the total number of vessels involved in the protest to beyond 200. 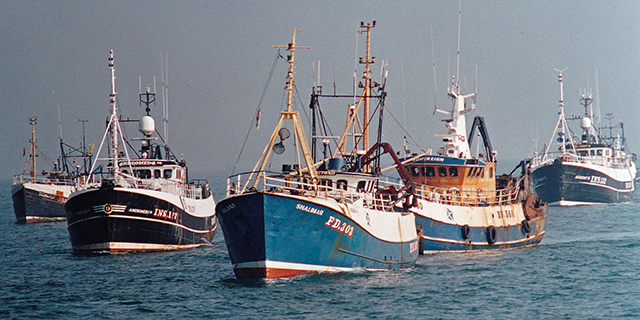 The unity engendered by the stock-conservation-focused tie-up the fishermen implemented voluntarily, is shown by the fact that, at one stage the convoy of boats – ranging from under-10m creel boats and prawn trawlers, to 40m deepwater stern trawlers – stretched 11 miles astern of Fairline and Budding Rose, which led the flotilla up the Firth of Forth. Boats from Fraserburgh, Peterhead, Aberdeen and Eyemouth collectively steamed 25,000 miles and used more than £100,000-worth of fuel. Such action came after voluntarily tying boats up for two weeks, during which time grossings worth several million had been forfeited. This indicates the utter and total revulsion to the widespread destruction of small fish that Scottish skippers shared, and the strength of feeling, history and unity they brought to their fight. Seamanship of the highest order as vessels move into position in the Firth of Forth. 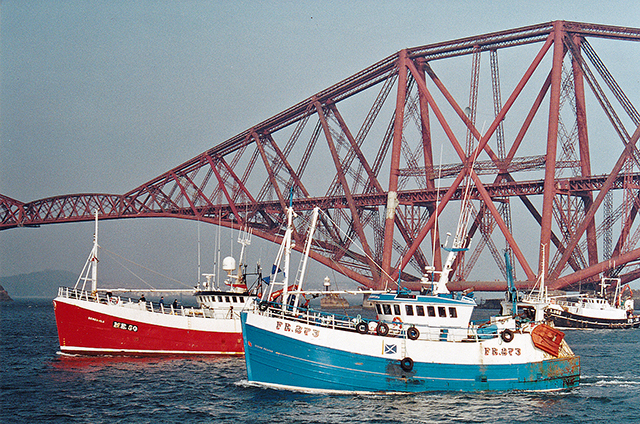 United we stand – creel boats, under-10m and 18m prawn trawlers, and 27m pair-seiners steam together up the Forth. That such a protest is unparalleled in the long and proud history of fishing signifies the extent to which fishermen had been pushed. Rather than sit back, they were making a dignified statement of their intent to fight for their future and their long heritage. No one should underestimate the feat that was achieved in March 2001, where seamanship of the highest order was taken for granted by the watching public, media and politicians. The Forth bridges slowly come ever closer. For all those who took part in what was the largest single demonstration ever mounted by the fishing industry, it proved to be an occasion that will live in the memory forever. Throughout the day, the key words were professionalism, responsibility and dignity, as skippers and crews showed the highest standards of seamanship when manoeuvring their boats in close proximity to each other and the buoyed channel. 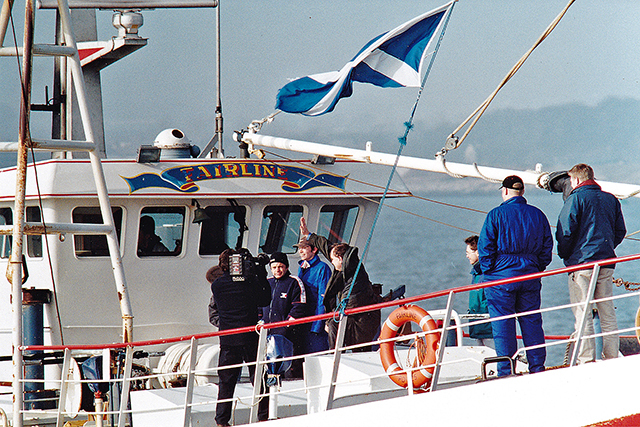 Interviews conducted aboard Fairline with Alex Salmond, then MP for Banff and Buchan and former Leader of the SNP, were broadcast on national TV as fishermen delivered their message to millions of viewers. Alex Salmond talks to the press aboard John Buchan’s Fairline. The following day, Scottish Fishermen’s representatives had a meeting at the Scottish Parliament with First Minister Henry McLeish and Rhona Brankin, when the need for immediate aid to enable an eight-week compensated tie-up scheme, to be implemented until the areas closed under the cod-recovery plan were re-opened, was emphasised. Eighteen hours later Ms Rhona Brankin announced that a £27m decommissioning scheme would be introduced for Scotland. Less than two hours later, an amended motion calling for funding for an immediate short-term tie-up scheme was voted through Parliament. This was subsequently overruled by Ms Brankin, who announced that she was standing by her original proposals, stating that Parliament was evenly divided on the issue and that in such circumstances the Executive had to make a judgement on how to proceed. History shows that the initial decommissioning scheme was subsequently expanded and followed by a second round of scrapping, which led to 165 Scottish vessels being broken up between 2002-2004. This total included a large number of the boats that had assembled in the Firth of Forth on a foggy morning, when the future of the Scottish fleet was shrouded by uncertainty. 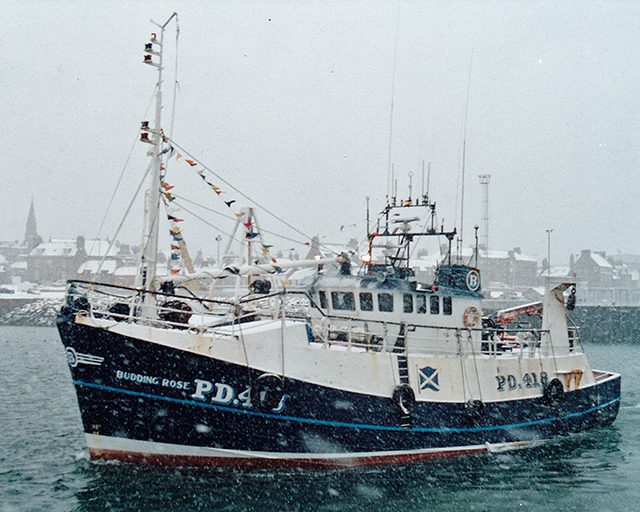 Budding Rose leaves Peterhead in blizzard conditions to join another 44 whitefish boats that steamed south to Aberdeen to raise awareness of the plight they faced. Fifty-two English boats were decommissioned during the same period, together with 48 from Northern Ireland. That this level of decommissioning changed the UK fishing industry for all time is beyond dispute. So too, is the fact that hundreds of British fishermen, together with their families and the coastal communities in which they lived, paid a very high price by losing their jobs and the income these brought, together with their previously well-established way of life, for which, in many respects, the implementation of the cod recovery programme, heralded the beginning of the end. The frontrunners return down river as other boats in the convoy continue to head into the sunset and their destination.